Ronda has proven how ruthless she really is. Over the last number of weeks, we have been watching two of the hottest storylines play out right in front of us. The storylines are of course the Becky-Ronda-Charlotte drama, and also the ongoing saga of Vince McMahon repeatedly tricking Kofi Kingston out of a WWE Championship match at Wrestlemania. To say that WWE have made a huge convoluted mess of both storylines would be a massive understatement. The storylines have felt like they have been made to drag out in order to fill in time till WrestleMania, by also adding unnecessary elements of filler content. This has started to get repetitive and seeing the McMahons get involved all the time using the same underhanded tactics, is nothing surprising to the WWE Universe. At the beginning of both storylines, it was ok for Vince McMahon to get involved and add a little bit of spice that was lacking from it. However, the constant obstacles that each of them keeps on facing is ridiculous, especially when we know they will eventually get their match. It's a classic McMahon storytelling device that he seems to go to go to the well with way too often. The whole authority figure vs underdog has been done to the death in WWE and creative need to think of new ways to make people excited for storylines. It seems that Vince always goes to the same methods that he always used to work to try and get people over, but sometimes they're outdated and overdone. I must say that I was genuinely excited when the whole Becky- Charlotte- Ronda storyline started off, but the further along it went the more it seemed to drag along. We have seen plenty of twists and turns, as well as unnecessary elements like Stephanie McMahon and Triple H getting involved, teasing a rivalry with Becky while she's trying to focus on Ronda. Somehow Vince McMahon got involved by adding Charlotte and suspended Becky. All of this really was unnecessary and confusing, to say the least. Adding unnecessary elements to a storyline as big as the Becky- Ronda- Charlotte storyline has literally cooled this rivalry right off now. Even the WWE creative seem to be writing it on a weekly basis making it even messier and overexposed. Why are Becky and Charlotte talking about the Raw Women's championship over on SmackDown Live, when the focus should be on Asuka and building a credible challenger for herself? It would be better if Becky and Charlotte moved to Monday Night Raw to help further the feud with Ronda Rousey, not that it needs any more exposure, but a few physical segments rather than talking could help it. The only way the physical segments are going to help though is to keep the momentum in the storyline for the next two weeks till WrestleMania. At the moment, the company seems more focused on Ronda Rousey's heel turn. She's already playing that role to perfection and should have been in that role all along, even though some of her remarks of wrestling being fake are not warranted. 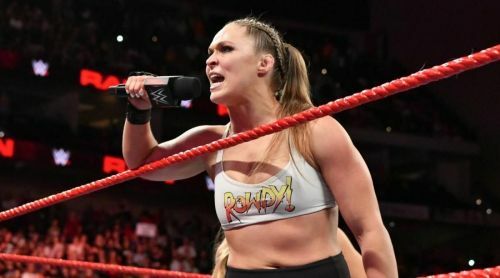 The company does not need to really do anything to legitimize Ronda, as you only have to have a look at her credentials and you would know that she's an a**-kicking machine. The focus should be more directed towards building Becky and Charlotte up as serious threats to Ronda. Maybe making them have a few more matches with others on Smackdown would have built up their credibility. If WWE wants us to believe that either one of them could beat Ronda, then maybe a little less talk and a bit more action would of went a long way. Realistically, neither of them have much momentum going into this bout, due to being kept from getting an injury. Whilst it is understandable, it has hurt them a little bit and has resulted in Becky Lynch's momentum being cooled right down. I do believe she still deserves to and will win at WrestleMania but Charlotte will take the pin to protect Rousey. It is the only logical thing left that makes sense if Becky is still scheduled to win. Kofi Kingston on the other hand just keeps getting screwed over by Vince McMahon for no particular reason at all. It's unknown why it's dragged out this long as he has already proven that he belongs in the main event scene. It would have been better if Vince just gave him his title shot after winning the gauntlet match this week on SmackDown Live, instead of screwing him over yet again. Honestly, I don't think they could get Kofi Kingston more over with the WWE Universe than what they already have, as the support he has now is reminiscent of Daniel Bryan in 2014. I can understand to a certain extent that they may want to maximize their investment into Kofi Kingston, to make sure his popularity doesn't wane anytime soon, but they are honestly doing more damage to it by constantly screwing him over and dragging it out. This coming week on SmackDown Live, the company need to solidify his place in the WWE championship match so that he can build his storyline with Daniel Bryan. Either make him face his last obstacle so that they can confirm it, or have the New Day protest to Vince McMahon by taking SmackDown Live hostage, much like the Occupy Raw segment in 2014. Then they can demand Kofi gets his opportunity finally. He has definitely jumped through enough hoops for Vince McMahon to earn his title shot. To summarise everything up and going by how many obstacles Vince put in the way of both Becky and Kofi, there needs to be a serious payoff to these storylines, with both underdogs winning their respective matches. Seth Rollins has been built as the underdog for the Universal title, however, due to the poor build up of this match, I have decided not to focus on his storyline in this article. It would definitely be a nice for the fans if Seth, Becky and Kofi all won their matches, however that won't be the case. At least one of them will lose. Wrestlemania 35 is fast approaching and so far looks to be epic. Let's hope WWE can deliver a great show.